This Old Navy dress is one I've worn a whole slew of times, but somehow never manage to get blog pictures of. (Here's my favorite Instagram outfit selfie of it.) Sadly, it's sold out in blue, but it's still available it in black, red and a black and white patterned option. 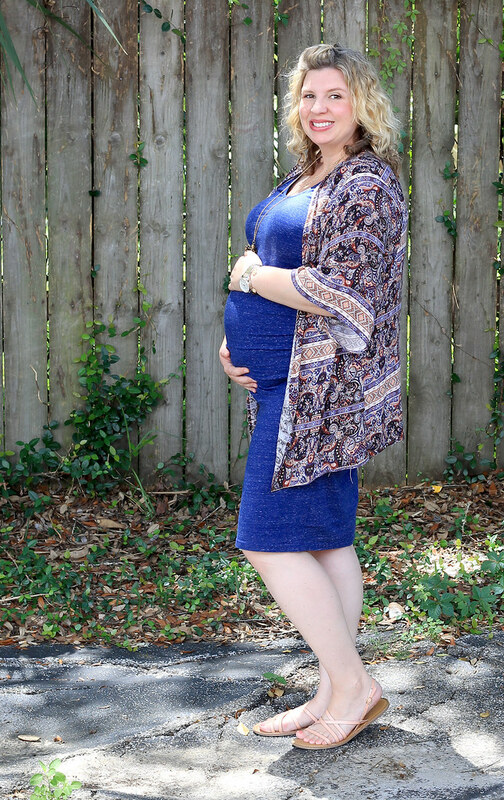 If I wasn't so far along in my pregnancy, I'd be tempted to pick it up in a few more colors, but heaven knows I have enough maternity dresses and I did just buy two pairs of maternity shorts for our upcoming baby moon trip next weekend. When the temps are going to be in the 90s with 100% humidity, I'll wear the least amount of clothes possible to be comfortable - even hated shorts. The cream, lace maternity shorts I mentioned Tuesday arrived yesterday, and I love them - so freaking comfy - AND I got them on sale for under $10! Today makes 32 weeks pregnant and time for another bump update. We had an ultrasound yesterday and it was a bit of a dozy. While baby boy is perfectly healthy, we did find out that he's frank breech and freaking HUGE - like in the 98% percentile huge - as in tracking at 36 weeks, not 32. We have a lot of tall men in both my and my husband's family, so I guess it's not so surprising that he's a big boy. Because of his size, it's very unlikely that he'll be able to turn head down by the time of delivery. We could try to have him manually moved - I know people that have had success with that - but due to his projected large size, he'll quite possibly be big too big to deliver vaginally. Basically, it means I'm looking quite possibly at a c-section. The doctor is going to keep a close eye on him to see how he continues to develop. But in the meantime, I'm trying to mentally prepare myself for a delivery different than what I was expecting. But the most important thing is that his healthy and so am I and the rest of it will get sorted out. Hoping all goes well for your labor and delivery! Love a knit stretchy dress, they just work. And so comfy. I swear I could live in stretchy dresses.